We can think of nothing more dreamy than a vacation in the Cyclades, island hopping around some of Greece’s most iconic isles renowned as much for their beauty as for their individual character—Mykonos with its blue-domed churches and celeb-heavy beach parties, Santorini with its cliffside hotels and romantic caldera views, Milos with its sea caves and painted fishermen's houses. 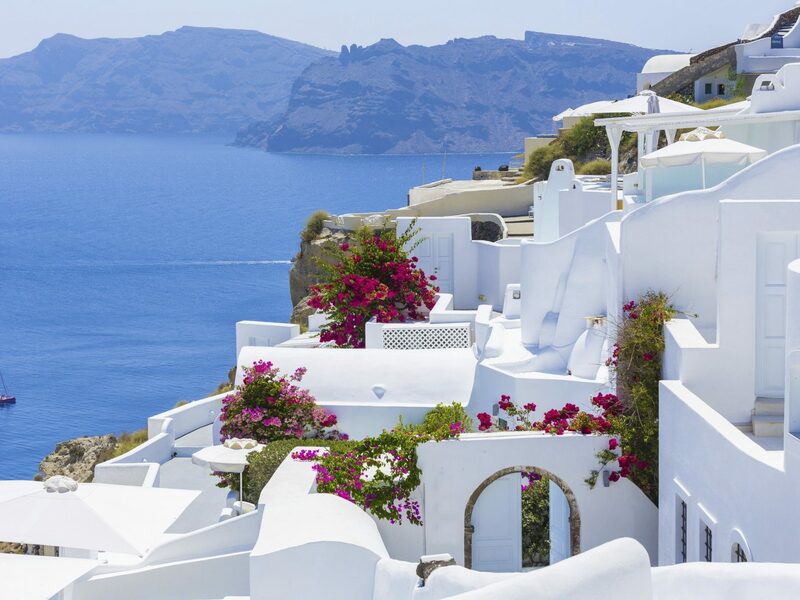 See it all on this perfect 7-day itinerary of the Greek islands. The jet-set island of Mykonos might be best known for its swanky beach bars and see-and-be-seen restaurants, but the capital’s winding marble streets and historic windmills offer just as much charm. 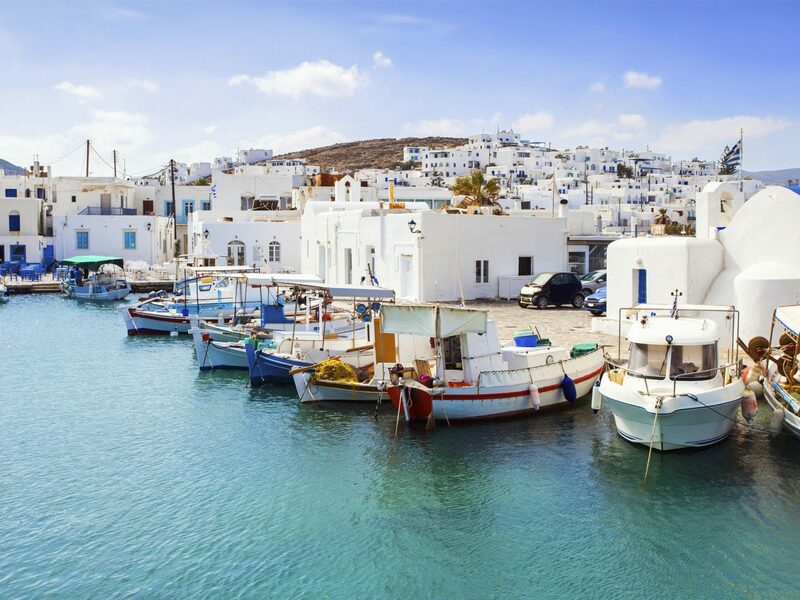 Get your bearings in Mykonos Town by exploring its maze-like lanes lined with churches and purple-hued bougainvillea trees, then stop for a shopping spree on Matoyánni Street, one of the island’s most famous strips. 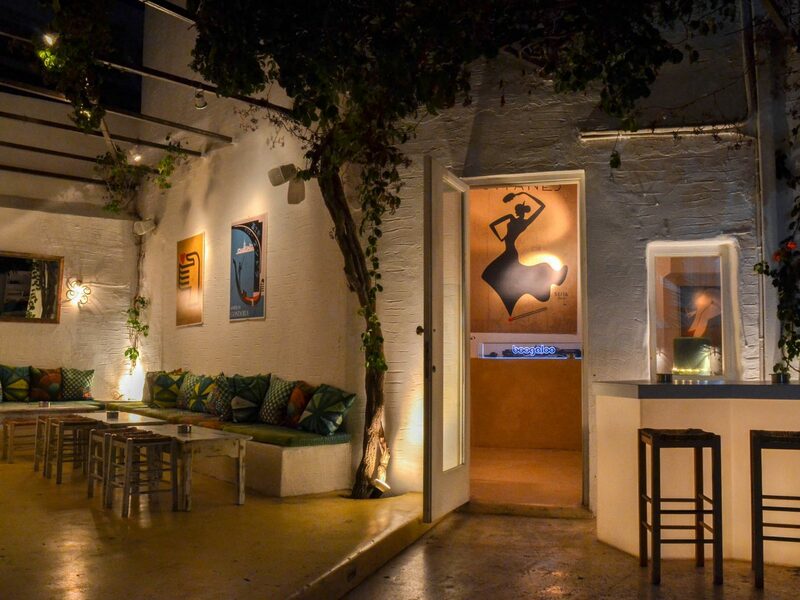 When you’re feeling peckish, take a seat at the newest outpost of Athens organic hotspot, Nice n Easy, and dig into Cycladic sea urchin or traditional moussaka on the open terrace facing the sea. Days can easily turn into nights on Mykonos. Start with cocktails at Nammos on the sands of Psarou (the island’s most famous beach), where even the sun beds are designer (think mattresses from luxury Italian clothier Loro Piana). Be on the lookout: the haute dining scene here is known to draw its fair share of A-listers like Leonardo DiCaprio. 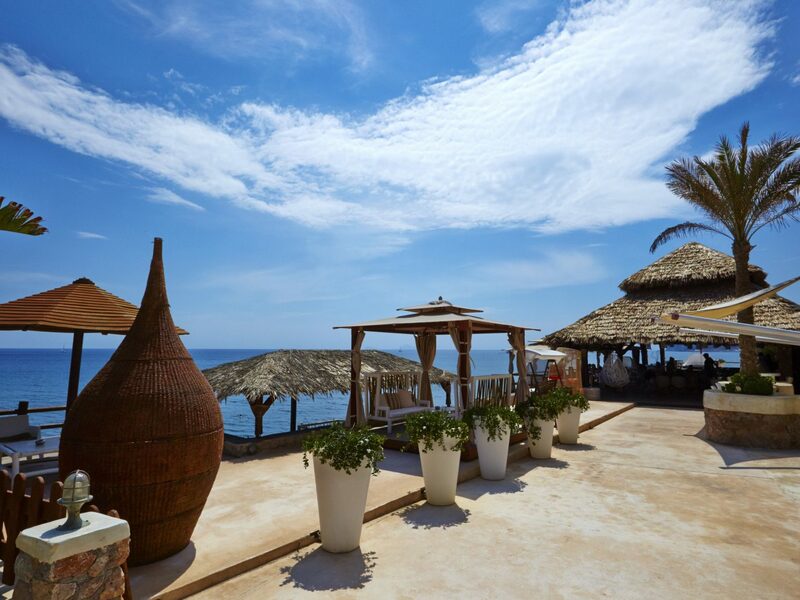 For something a little more low-key, try Nesaea on Kalafatis Beach. 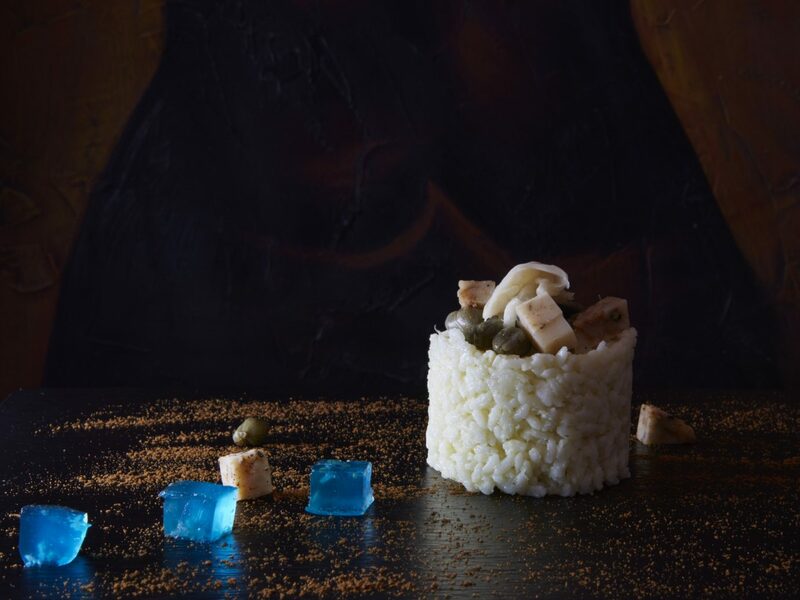 The farm-to-table eatery debuted last summer and serves up deconstructed Greek staples with ingredients sourced across the islands. When you’re ready to call it a night, fall asleep to views of Psarou from your villa at Mykonos Blu, a whitewashed, cubist-style hotel whose private infinity pools extend over the Aegean. Start your second day in the birthplace of the immortals by jetting over to the archeological sites on the island of Delos, just a 30-minute boat ride away. 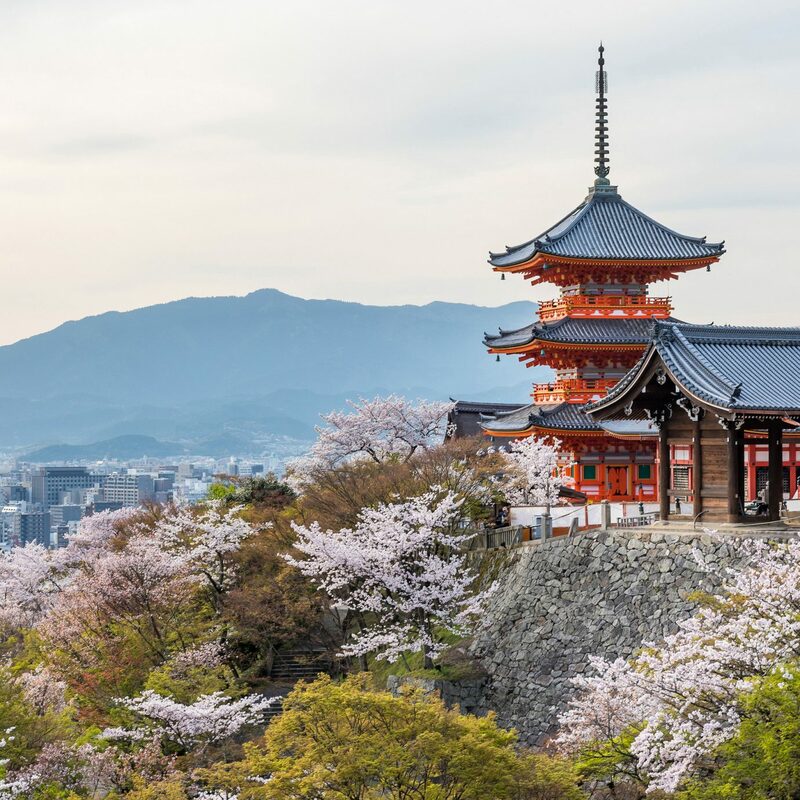 The entire island, whose ancient streets are lined with temples and Greek antiquities, is like an alfresco museum and a must-visit for history buffs. 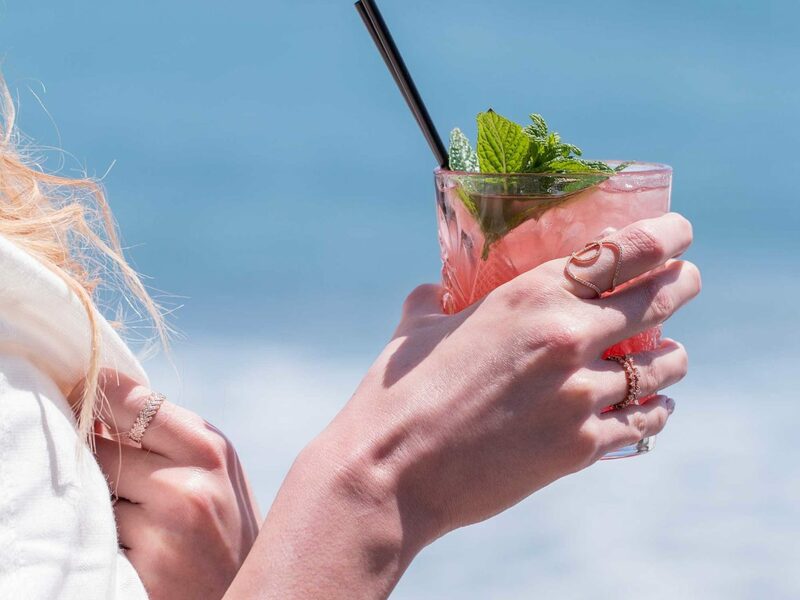 Spend the rest of the day beach hopping by private yacht, anchoring at minimalist-chic beach bar Panormos Beach, known for its freshly-made ceviche made with fish caught just off the coast. Alemàgou, in Ftelia, is another rugged beach bar that resembles Mexico more than Mykonos: its thatched-roof sun beds dot the shore, and DJs narrate the scene from a seaside stage. When the sun starts to set, make your way to Ornos Beach and sit along the shore under twinkling lanterns at Kuzina, an open-air eatery serving up Asian-influenced Greek fare (olive-and-feta-cheese-mousse-stuffed dumplings; salmon filet with soy sauce and ginger), before bopping back to Mykonos. 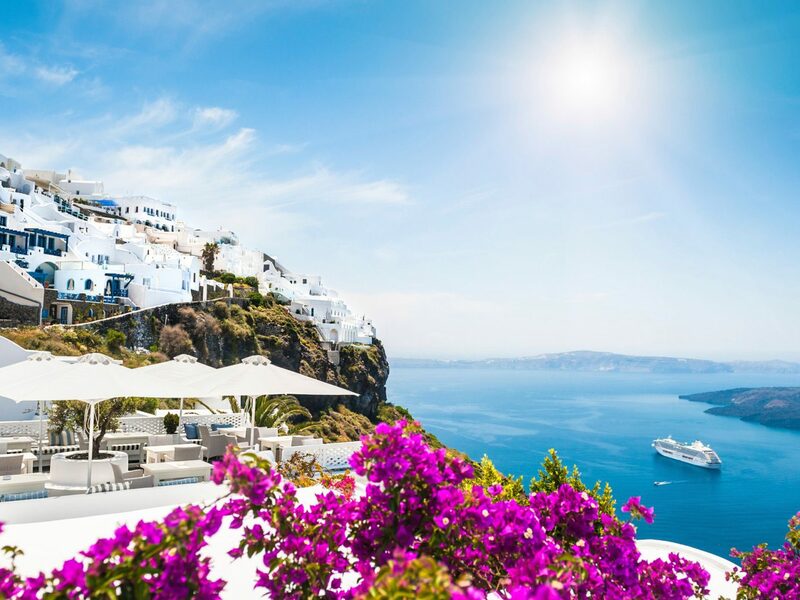 After one final lazy breakfast at Mykonos Blu, hop on the high-speed ferry, which travels from Mykonos to Santorini in less than three hours. 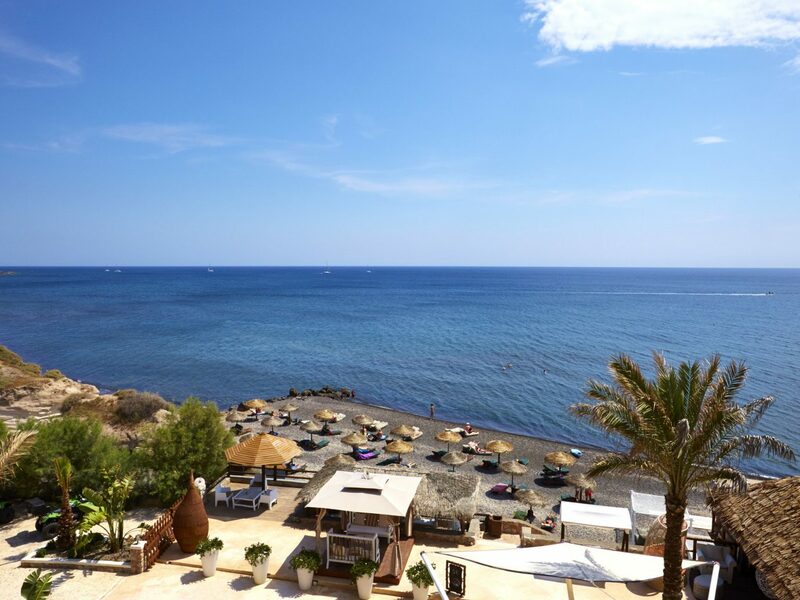 Begin the afternoon at what, according to locals, is the island’s best beach bar—Theros Wave Bar at Vlychada Beach—and stay for sunset to admire the view of the sea and distant cliffs. For dinner, it’s off to the capital of Fira to feast on moussaka soufflé and veal cheeks with tzatziki cheesecake at Koukoumavlos, housed in an 18th-century sea captain’s home. 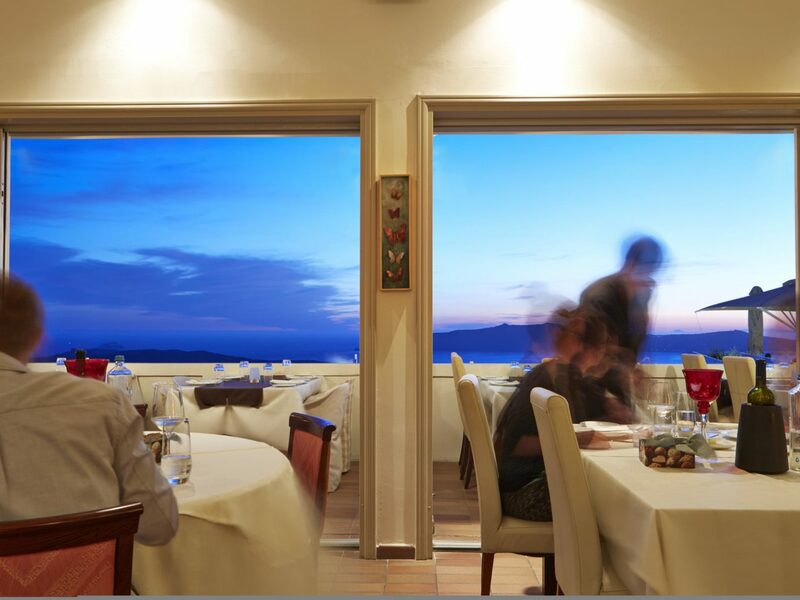 While the food here earns rave reviews, it’s the terrace, with its vistas of the Santorini volcano and caldera, that’s the true showstopper. 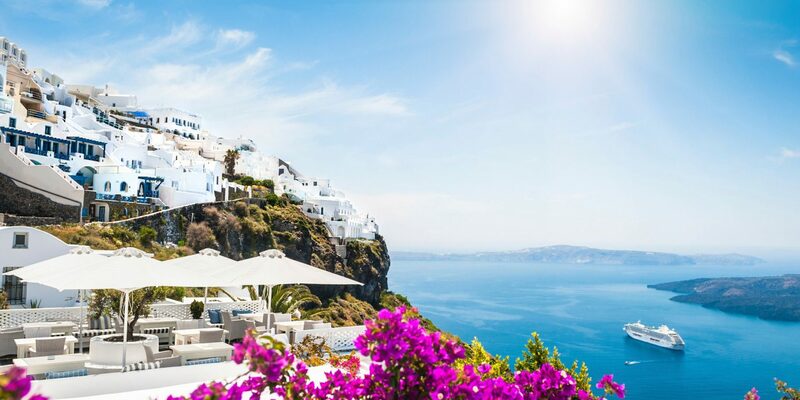 For a signature Santorini experience, check into one of the cave homes, or any of the island’s fabulous cliffside hotels. Our pick: Katikies Hotel for its bright-white rooms and stunning infinity pool. One of the best ways to get a sense of Santorini’s varied landscape is from the water, during a caldera cruise through hidden coves and hot springs. 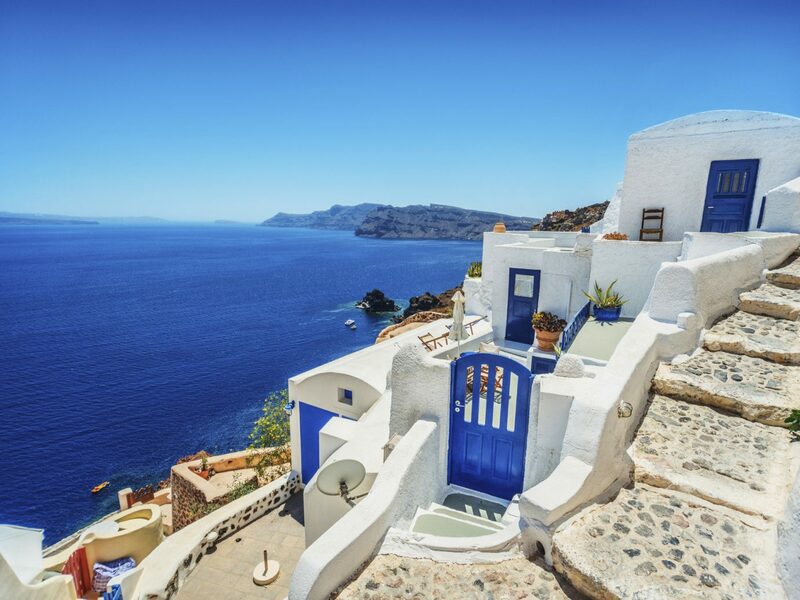 A catamaran tour with Travel2Greece passes by sites like the volcanic island of Thirassia—a time-trapped version of Santorini—and the Efta Pedes church, built inside a cliffside cave along Mouzakia Bay. If you really want to escape the crowds that cram the streets of Fira and Oia (especially come July), opt for lunch at Mesa Pigadia by Akro, a secluded restaurant housed in a cave with a private beach just below. 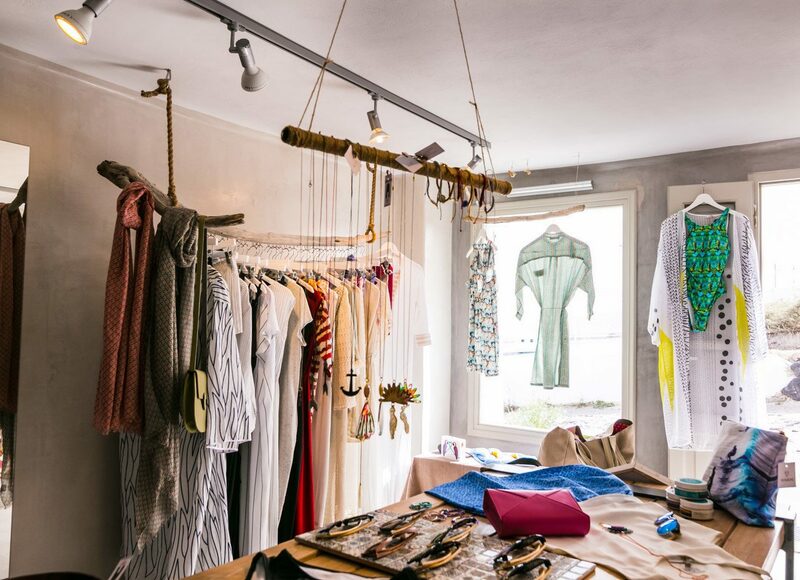 Squeeze in a bit of shopping between beach visits at boutiques like Under a Fig Tree, whose collection spotlights Greek designers, or any branch of Ammos, which stocks everything from Missoni dresses to Mykonian towels. 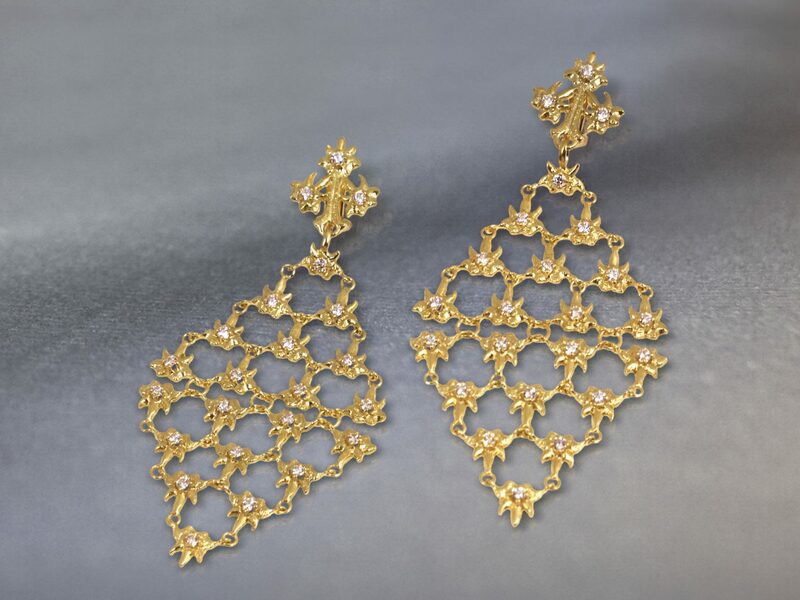 Another don’t-miss is Ilias Lalalounis, in Fira, whose handmade gold Greek jewelry takes inspiration from the styles of ancient civilizations. Santorini’s postcard-perfect village of Oia, with its blue domed churches and white cave homes, is the perfect place to spend the evening. 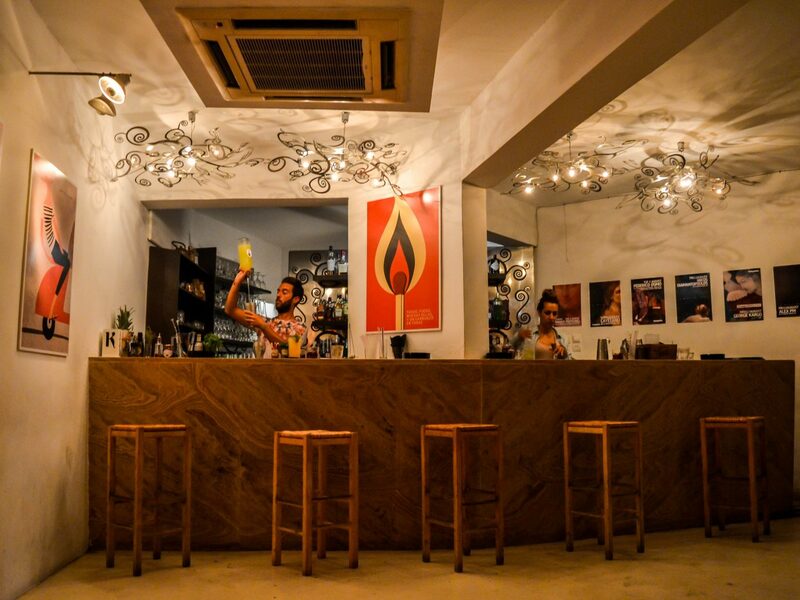 Pop in for a drink at Hassapiko, an Oia institution that’s housed in a former butcher shop and referred to by locals as "Marikey’s bar." For dinner, request a seat on the terrace at Metaxy Mas in the untouched farming village of Exo Gonia. Its old stone cottage-turned-tavern is tucked behind the church of Agios Charalambos, one of the largest churches on Santorini with a unique red-tile roof. After dinner, taxi back over to Oia and tuck into one of 27 suites at Andronis Luxury Suites, whose cave-live rooms come with beds raised on stone platforms and outdoor plunge pools. It’s early to rise this morning for the two-hour-long ferry to Milos—you’ll want to be on the island well before lunch time. Once you’re there, make your way to the northeast part of the island for a dip off the shores of Sarakiniko, one of the area’s most photographed beaches owing to its lunar-like white rocks that rise out of the jewel-colored sea (Warning: most of Milos’s best beaches and coves can’t be reached by land). Set up a private charter with Travelive and sail around the cove of Kleftiko, a former pirate hideout where you can swim and dive for urchins. Back on land, stroll around the maze-like pedestrian streets of Plaka, the island’s capital, which sits 700 feet above sea level. 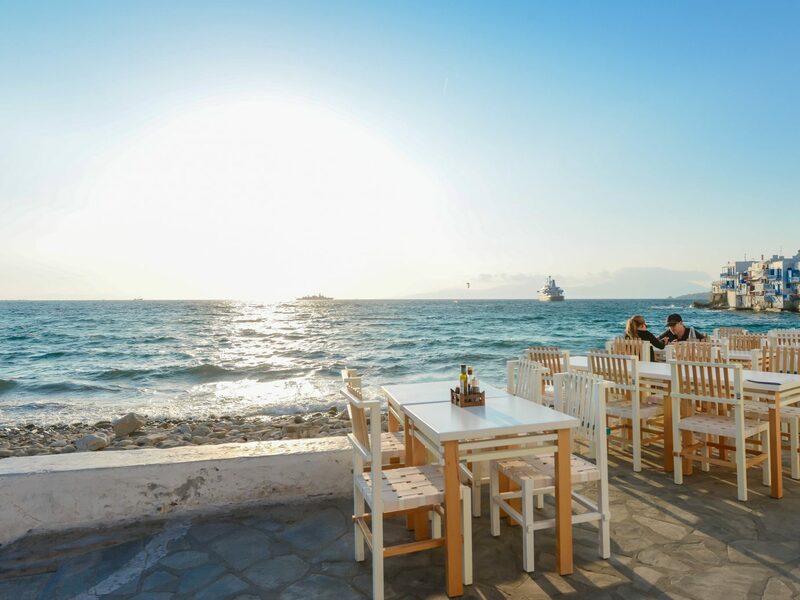 Here, you can soak up views of the sunset while indulging in traditional homemade sweets like baklava (a honey-and-nut-filled pastry layered with flaky phyllo dough) from family-run Kivotos ton Gefseon. 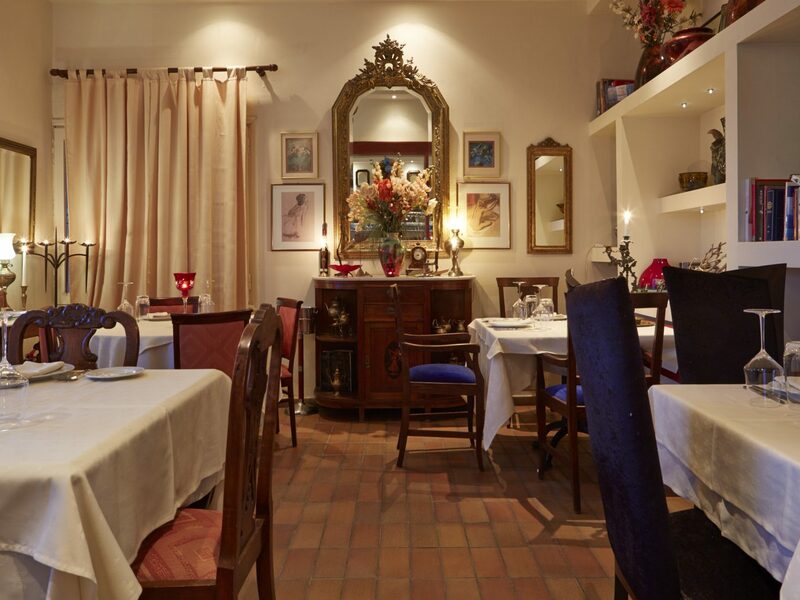 For dinner, make the quick trip over to Barriello in the center of the Trypiti town square. The sweeping views across the bay are worth a visit alone, but we also love the soulful Mediterranean dishes like farm rabbit marinated in Cretan wine and lentil salad with lime and orange. 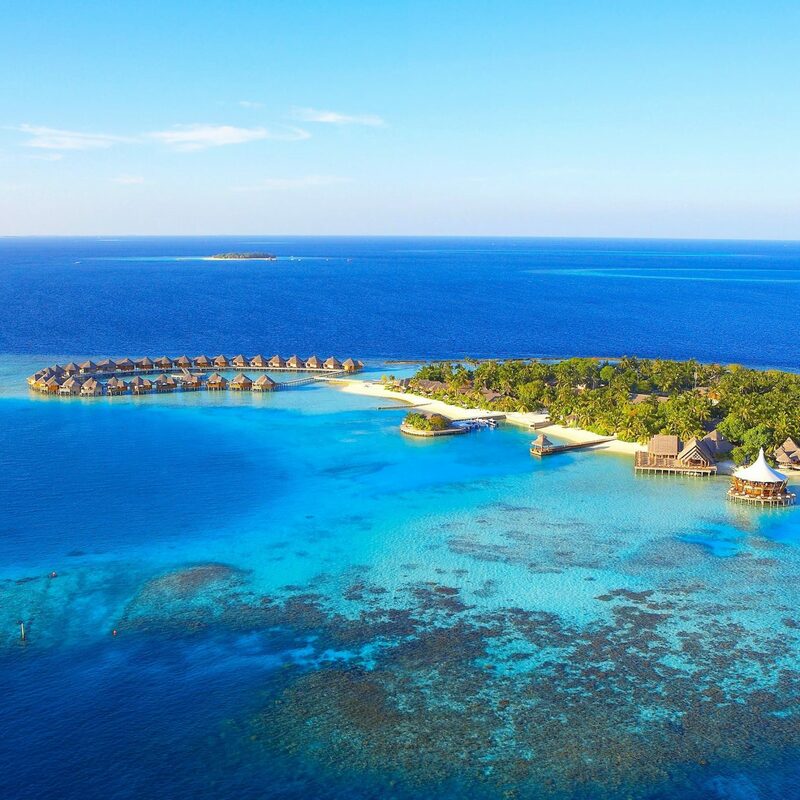 After all that sightseeing, rest your feet in one of the 15 sea-facing suites at Melian Boutique Hotel & Spa, done up with handmade furniture and local art. Paros is often decribed as a smaller version of Mykonos, but the island has a character all its own. 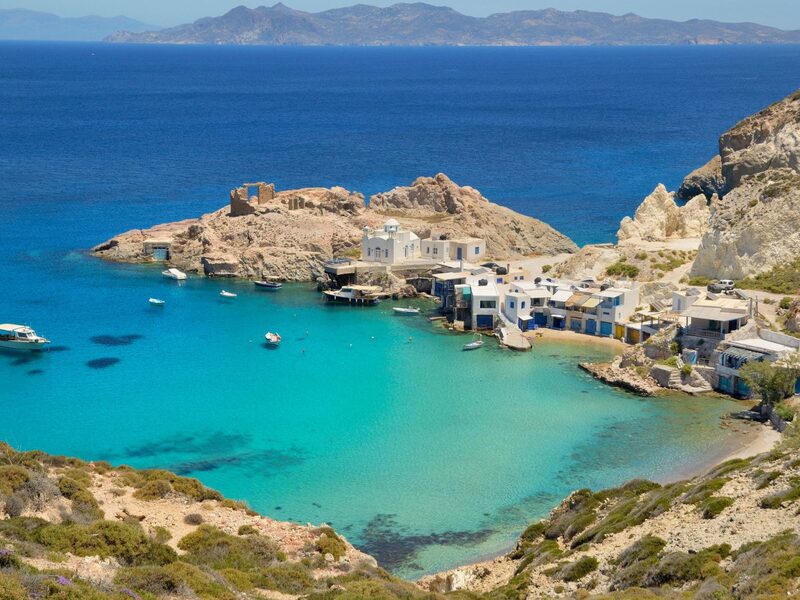 After the ferry ride from Milos (which clocks in at just under four hours), make the most of the rest of your day by cruising the island’s bays by sailboat, before anchoring at the smaller, more untouched island of Antiparos (also reachable via a 10-minute ferry ride). 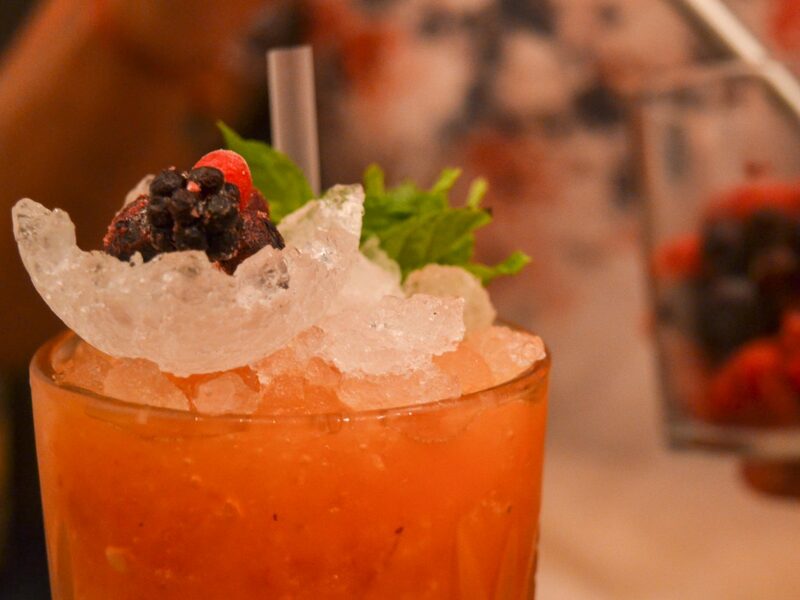 Get your bearings with an espresso at the main square—or a cocktail at sister spots Boogaloo Cocktail Bar and Tabula Rasa—before checking out the the island’s top sights. A highlight: Antiparos Cave, with carvings that date back to the Stone Age. 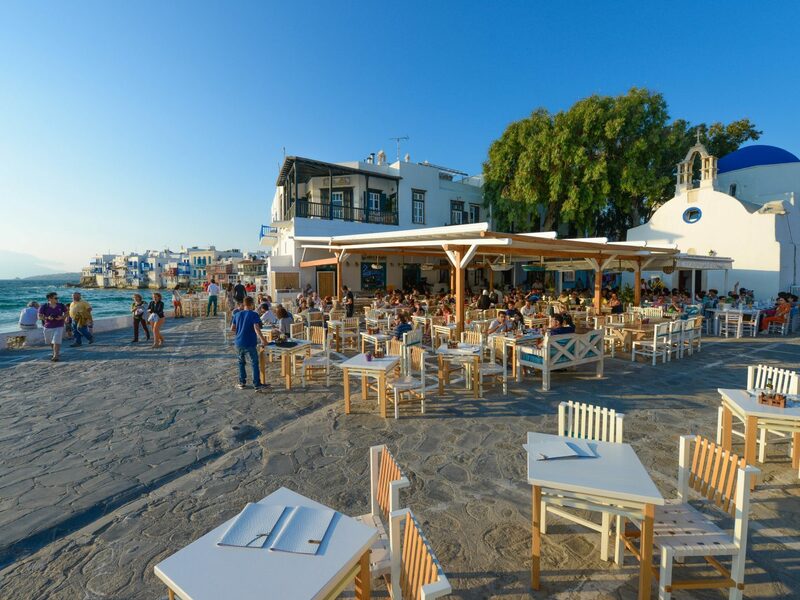 Back on Paros, dine along the port at Mediterraneo Paros, toasting the evening with Greek ouzo (an anise-flavored aperitif) and a series of seafood meze, or tapas. Then, cozy up for the evening in the 16-room Hotel Papadakis, which not only shows off one of the best views of Naoussa Bay but has also earned a reputation for having the best breakfast on the island. No surprise there, considering the owners happen to be the mother and sister of celeb Greek chef Argiro Barbarigou. 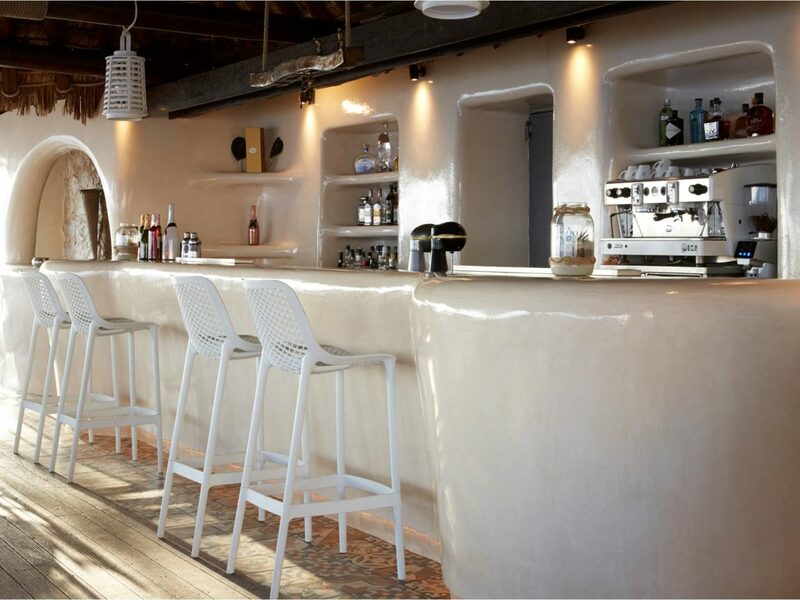 Round out your week of island hopping at Náxos, the largest isle of the Cyclades. A high-speed catamaran from Paros will get you there in 30 minutes. 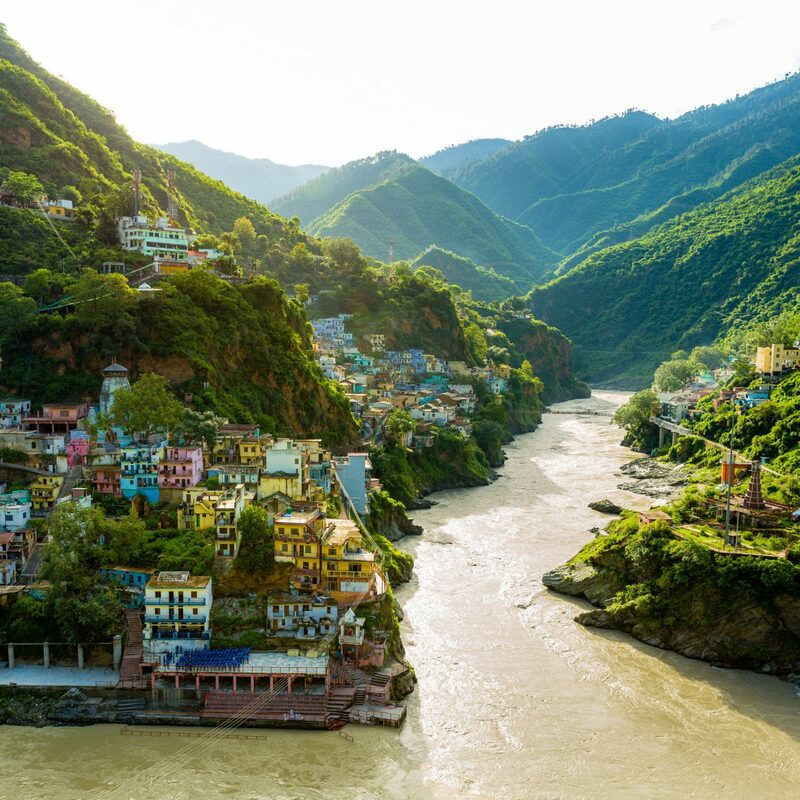 It’s up to you how you spend your day, but we have few suggestions. 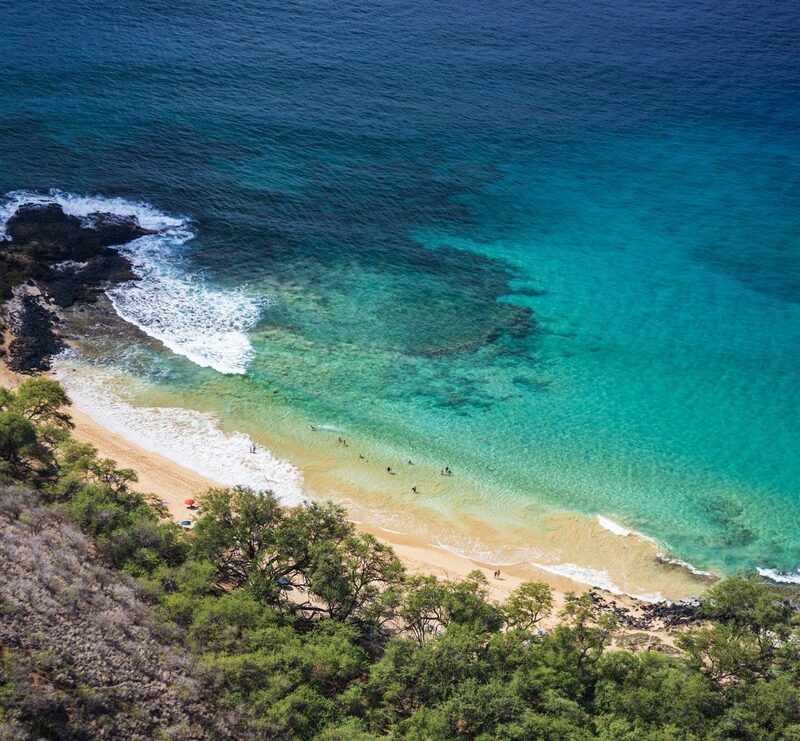 Locals love Hawaii beach on the southwest side, where sheer cliffs rise up some 30 feet from its untouched sands. Hiking trails from the towns of Halki and Apeiranthos pass by more tucked-away archeological sites, Venetian castles, and caves. Leave enough time to check in (and check out) at the Naxian Collection, a smattering of white-washed Cycladic-style villas run by a local couple, where you can share a glass of wine in the cellar with owner Yannis or pick produce from the organic garden with his wife, Maria, who can teach you the secrets behind her locally inspired menu during a one-on-one cooking course. You’ll feel like you’re staying with family—a perfect way to spend your last night in Greece.